Dear authors, when it comes to author visits, more than anything I wish for bookings to come easy and for you to get paid decently. I wish for the school to be decorated welcoming you and even a student to greet you. A parking spot will be readily available, the room will be set up including water to sip, and students will be brimming with questions yet respectful at all times. When it comes to finding an artist, 80% of authors I brought in I found through an organization or a referral, while the remaining 20% contacted me directly via phone or email. This means either call or email a prospective school. Best bet is to reach out to the librarian (contact information should be on the school website). Make sure when you call or email that you get to the point (time is precious). And/or: Connect with local writing organizations in your area. This could be your writers’ guild, SCBWI, or an organization that hosts a literary festival. 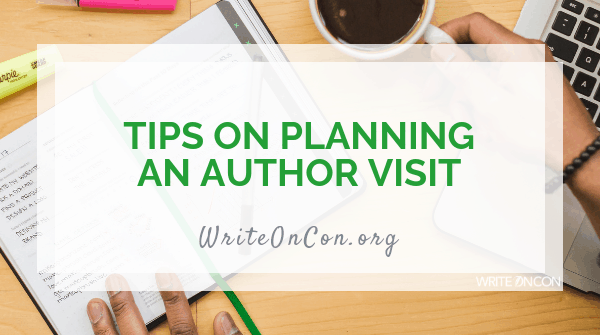 It’s convenient as an organizer short on time to skim through author profiles on a festival site. Plus, some festivals offer grants to school or opportunities to win an artist (win-win as you get paid and the school gets a break). Once you know all the details put them in an email so there is a paper trail. I once had an author quote me a flat rate over the phone only to turn around and send an invoice with an extra $15. If you misquoted that’s okay; just make sure to talk to the organizer about it vs. blindly sending an invoice. Some schools, like mine, are on a strict budget so an extra $15 matters! Please send an invoice as early as possible as it can take a couple of weeks to get a cheque ready. Once getting paid is out of the way, it doesn’t hurt to draft a quick email that entails what you need (smartboard, table for books etc. ), where to purchase your book or if books will be available during the visit (include cost), and expectations such as a teacher being present (I would never leave an author alone but it does happen and its not your reasonability to supervise!) Plus, as an organizer it’s nice to refer to this email vs. trying to remember what was discussed (but keep it as brief as possible). Bonus: let the organizer know if your book ties into the curriculum, or even better, send them an activity they can do with students beforehand. It’s much easier to justify a visit to admin when there are clear ties to the curriculum, plus an activity is a great way to prime kiddos for your visit. Extra bonus: let the local media know about your visit (this is something I do for my artists, but I wouldn’t expect this as typical as I have a training in media relations). Media attention is good for you and for the school. Media or not, be prepared to have your photo snapped (many schools have social media). It doesn’t hurt to ask the organizer to forward you any shots of the event to use on your own social media. Sometimes things happen that are out of the organizer’s control. In my case, my school is undergoing a modernization, which means sometimes things get changed at the last minute. My most recent author requested a dark room, something I was only able to do for one of the two sessions. But she went with the flow and I was very grateful. If a student acts up, I’m embarrassed. I will do my best to address the situation but don’t be afraid to jump in if you’re comfortable. Things will likely not be perfect. Be adaptable. But if something is missing, ask for it (glass of water, extension cord etc.). Plan extra. Things may take longer or shorter than you think, so prepare, prepare, prepare, such as having questions in mind if students are too shy to ask questions at the end. Show your heart. Don’t get me wrong, you need to be professional, but SHOW YOUR HEART. Students and staff will respond better to this. Above all else BE NICE, as librarians talk with other librarians. In fact, authors in my district have been invited to other schools as a result of a referral. Follow-up with the school even if the visit wasn’t perfect (this is just good business practice). I typically send out a thank you to the artist and a photo or two of the event, but don’t be afraid to send a quick thanks and request for photos if any. Feel free to request a return visit but don’t be offended if the organizer isn’t able to. I try my best to expose students to various artists and this means I can’t always bring back the same artist. On a final note, I still remember the first author to visit my school as a child. While I don’t remember her name, I do remember how I felt — inspired. You have the power to inspire readers and storytellers and that’s pretty amazing! Stay tuned for my next post on tips to finding feedback on your work. If there is something I didn’t answer that you are curious about in regards to author visits, please comment below and I will be happy to follow-up.